30 OctSuffering From Bad Morale? Running an organization is not easy. Occasionally, I hear that it would not be hard…if it weren’t for the people. People do add complexity; there is not a manual that tells us how to manage and lead each person. 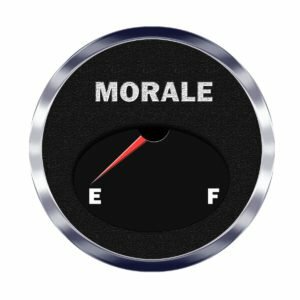 Some organizations have “bad morale”. At a minimum, most organizations have pockets of poor morale. These realities of organizational ineffectiveness are directly tied to company culture. Change can and should happen. Your organization can become more efficient, effective and employee’s can feel more job satisfaction. The most important part of understanding culture is a proper diagnosis. The Conscious Culture Group works with leaders to identify employee’s perceptions of their work experience and to provide practical solutions based on over 30 years of HR experience. We enjoy partnering with organizational leaders to create thriving organizations and an organizational climate where employees love where they work. Let’s convert poor morale into powerful engagement. Contact Conscious Culture Group today for more information on how to deal with poor morale in your organization.